First of all, I’ve really got to start Wikipedia-ing some of these entries before I choose them, apparently. I started reading Alan Moore’s 1963 series not knowing that… it doesn’t end. 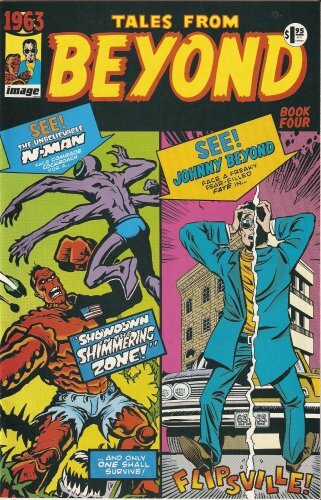 It’s a six-issue mini-series, and while yes, I have all 6 issues, the mini-series builds to a resolution that would be told in a giant-size crossover special called Double Image. Now here’s where this gets interesting: that book doesn’t exist. So this story has no resolution and just ends mid-tale, more-or-less. That’s always fun, as I’m sure you can imagine. We’ve al been there; just an issue or two short of a complete story. But now imagine those issues just flat-out don’t exist. I had no idea going in that this was the case; I had actually never heard of this comic before I started reading it, much less having known that it was an Image title. Which is really unusual because I was pretty into Image when this was being published… it just slipped under the ol’ radar. I guess the story—and I’m getting this from Wikipedia so if you want to get into it in more depth, have at it—is that the ultimate book that tied everything together was supposed to be handled by Jim Valentino but then Jim Lee wanted to do it, so Moore and the artists gave it to him. Then he just… never did it before he moved Wildstorm to DC. And in the meantime, Alan Moore, the not-at-all belligerent and grumpy chap that he is, developed some kind of beef with the artists of this series. So at this point, twenty years later, there is zero chance we ever see this concluded. Like, less than zero. Zero Kelvin. But this has all been a history lesson and not a comic review, so let’s talk funnybooks! What 1963 is (besides incomplete… I CAN’T LET THIS GO) is a collection of several short stories that culminate in a crossover between the introduced characters in the final issue, all parodying the Silver Age of the Marvel Universe. From the fake full-page retro advertisements (“SHAMED BY YOU ENGLISH? You can speak soon and write like a graduate if me let you help for a day of 15 minutes!”) to the whacky alliterative monikers (“Sensational Script by Affable Al Moore, Promethean Pencils by Roarin’ Rick Veitch”, etc) to the storytelling devices (characters that openly narrate their actions as they do them) to the pencils (a lot of panel backgrounds that are stripped down to little more than a single basic color), it’s all meant to harken back to that more simplistic time. The heroes of these tales all have somewhat more than just a sense of familiarity, as well. There’s the age-defying U.S.A. (Ultimate Special Agent) who gets his powers from a medication, the nuclear-powered rage beast N-Man, and the quartet of space-faring heroes who gained their powers on an interstellar mission gone awry (Mystery Inc), and that’s just a taste of them. The final issue even sneaks in a knock at DC when the heroes discover a multiverse, but can’t access all the available worlds because some Earths are “experiencing an infinite crisis”. All told, it is a journey through the comic world of decades past that really captures every essence of those old comics. These one-shot stories themselves are hit-or-miss—I enjoyed the U.S.A. and Horus, God Of Light tales, but was not particularly enamored of the Hypernaut or N-Man yarns—but altogether, they are the bones that form the skeleton of the 6th issue that features the heroic Tomorrow Syndicate. Not that Moore could have seen this correlation coming when he created this, but it reads like the Marvel Cinematic Universe that introduced Iron Man, Thor, and Captain America before tying them all together as The Avengers. The Tomorrow Syndicate gathers to find the missing Mystery Inc who vanished back in the first issue after a strange time-displaced man broke into their headquarters, the Mystery Mile. A trip through Mystery Inc’s Maybe Machine causes the Syndicate to bounce around a few alternate timelines (featuring a world where the heroes are all villains, a world where the Cuban Missile Crisis ended in much more devastating fashion, and a really weird one ruled by some teddy bear creature named Bimbo), these Fauxvengers find their way a grittier, darker Earth. This final destination is, of course, the Image Universe. And that’s where the story ends! Good night, folks! I hate to speculate on Moore’s intention for the ultimate tale of the past meeting the present. He was clearly building towards skewering something, but yeah… not like I’m ever going to find out what his goal was. +The stories themselves are fun enough. Like I said, some are better than others, but there are more good ones than bad. Mystery Inc, The Fury, U.S.A., Johnny Beyond, and Horus were all fine short stories individually, and honestly, I could see reading more about any of them. They were done that well in such short dosages. Moore manages to subvert the themes of comics’ Silver Age, but in a respectful fashion that shows he doesn’t dislike the foundation upon which the industry rejuvenated itself. In a way, a lot of it comes across as a love letter. Well, except in the references he makes to Stan Lee and the Marvel Bullpen; those are a little less complimentary. +Beyond just the stories, there are some nice Easter Eggs, like the Watchers as cosmic janitors, Superman in-between Earths carrying around his death certificate, and a YOU ARE HERE map of the multiverse. They are some cute touches that don’t detract from the story, but remind you with a wink what you are reading. -Well, gee whiz. There’s really only one huge one, since even a lot of what is “bad” in this series (lazy panel art, lame dialogue) is tongue-in-cheek and thematic: the lack of a resolution! The tales builds and builds, and when you get to end and want to see everything come together and it just doesn’t… that’s insanely frustrating. It’s pretty exemplary of Image’s run in the 90’s, though, isn’t? And Moore’s infamous inability to play nice with others for long, for that matter. But Image had so little consistency, and many of the creators seemed to get distracted pretty easily. I can’t really say I recommend this arc any more than I would recommend getting a delicious sandwich, taking one big bite, chewing it up for a minutes, and then spitting it out and throwing the sandwich away; you’re just not getting the whole experience. That said, as far as one-shot tales go, you could do worse. If you can temper the disappointment of not getting a conclusion, it’s an okay read, but even then, it’s not must-read material. Just… argh. What could have been, you know? 1963 was supposed to the springboard to creating a backstory for the “Image” shared universe, with books like Youngblood, Spawn, Dragon etc. I believe this series was supposed to finished in those more “current” books as these characters starting to appear more often. However, the “Young Guns” that jumped ship from Marvel and started Image couldn’t get their act together and the whole thing fell apart. This is mainly due to Jim Lee’s year long sabbatical and Rob Liefeld leaving the company. Hence the story is unfinished. This post although fantastically written made my heart hurt. I couldn’t have disagreed more. One of my favorite books of the mid 90s when the world was a wash with terrible comics. Who here would like us to discuss this on a future show? Leave your comments below. I really want to get all of these even without the actual ending. I have the Mystery Inc one and the USA Agent one. Super fun stuff.